Both of today's posts are centered around something very near and dear to my heart - the 'oops'. For example, almost every video I take with my camera is an accident, and begins with, "Oh, S#@%, I'm taking a video!" I make a lot of mistakes. Some turn out okay... some I sweep under the rug. I have a very lumpy rug. 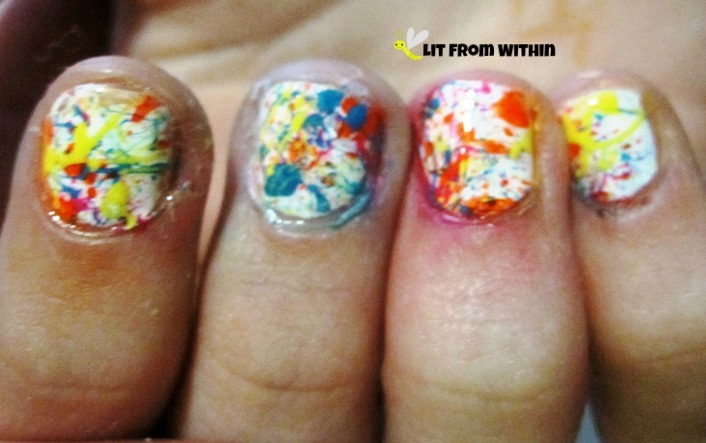 The first mani is a splatter mani I did for a friend. It was my first one, and I had a lot of lessons learned. The main oops is that I didn't put some kind of balm or vaseline around her nails because some of that polish *stained* and would NOT come off. So, even after lots and lots of cleaning and acetone, I could not get a clean mani. I also think that smaller straws would work better. And I have tried to use better lighting since then, too. 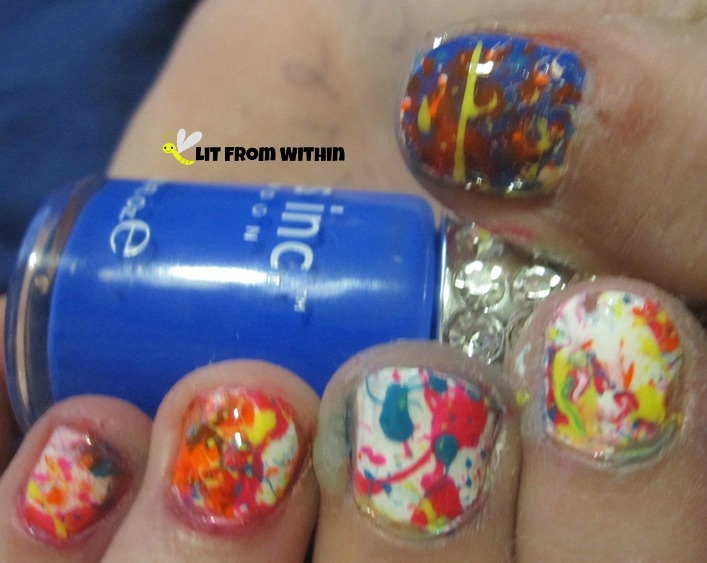 I can't remember all the colors I used, but I know that the blue base on the thumb is Nails Inc Baker Street, the orange is Island Girl Sunset Beach, the yellow is Zoya Pippa, and the splatter blue is Essence Let's Get Lost. 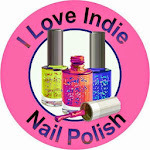 I'm glad that my friend Toni liked her mani, though, which is all that really matters. The next oops isn't so much the mani.. but I forgot to take pix, so I had to steal this from my friend Jill's Facebook page. 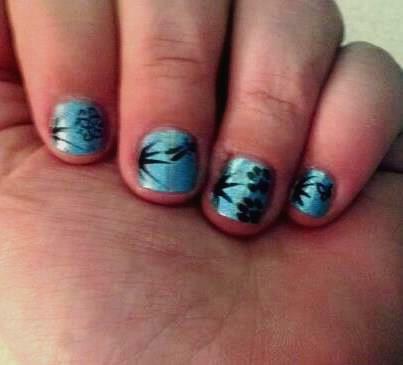 Jill wanted a mani similar to one I had done before, but with some added stamping. This is Color Club Over the Moon - in my opinion, one of the best blue holos out there - and probably Finger Paints Black Expressionism, my go-to black for stamping. The last oops is in the art. I had seen this mani from Raggio di Luna called 'falling black apostrophes on purple' that I loved and wanted to do a version of. 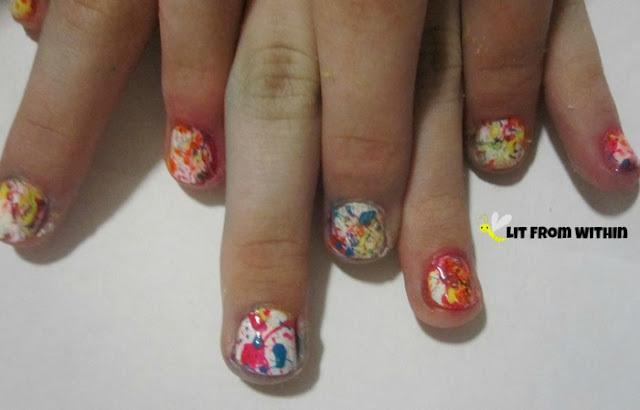 The colors I used were Deborah Lippman Brown-Eyed Girl, Finger Paints Paper Mache, and Pretty Jelly Hera. Yeah, I did white apostrophies instead of black. Do you see the problem yet? 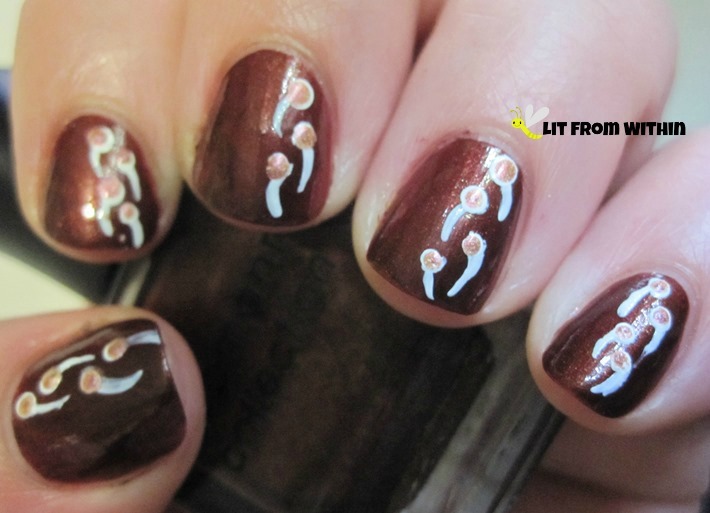 Yeah, I unknowingly did a sperm mani. FAIL. LOL. Embrace the mistakes, because if you're not making any, you're not trying hard enough. These are all really good!